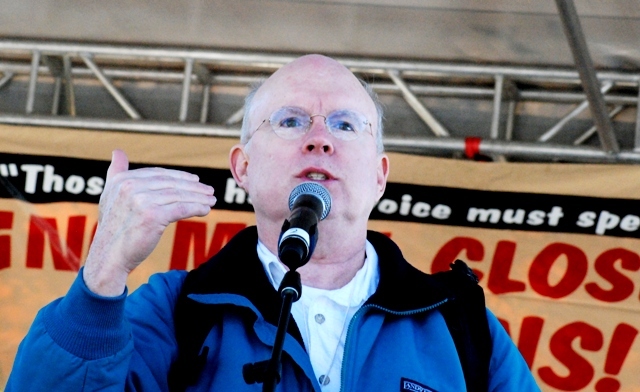 In this photo, lawyer Bill Quigley talks to thousands of SOA Watch supporters in Fort Benning, Ga in Nov. 2012. Eh urged the matchers to keep the pressure on until the School of Americas is closed. Photo by Wadner Pierre. Despite billions in aid that were supposed to go to the Haitian people, hundreds of thousands are still homeless, living in shanty tent camps as the effects from the earthquake of Jan. 12, 2010, remain. The earthquake devastated Haiti in January 2010, killing, according to Oxfam International, 250,000 people and injuring another 300,000; 360,000 Haitians are still displaced and living hand to mouth in 496 tent camps across the country, according to the International Organization of Migration. Most eat only one meal a day. Cholera followed the earthquake. Now widely blamed on poor sanitation by UN troops, it has claimed7,750 lives and sickened more than half a million. The Institute for Justice and Democracy in Haiti and its Haitian partner Bureau des Avocats Internationaux have filed legal claims against the UN on behalf of thousands of cholera victims. Recently the Haitian government likewise demanded more than $2 billion from the international community to address the scourge of cholera. Despite an outpouring of global compassion, some estimate as high as $3 billion in individual donations and another $6 billion in governmental assistance, too little has changed. Part of the problem is that the international community and non-government organizations (Haiti has sometimes been called the Republic of NGOs) has bypassed Haitian non-governmental agencies and the Haitian government itself. The Center for Global Development analysis of where they money went concluded that overall less than 10 percent went to the government of Haiti and less than 1 percent went to Haitian organizations and businesses. A full one-third of the humanitarian funding for Haiti was actually returned to donor countries to reimburse them for their own civil and military work in the country and the majority of the rest went to international NGOs and private contractors. With hundreds of thousands of people still displaced, the international community has built less than 5,000 new homes. Despite the fact that crime and murder are low in Haiti (Haiti had a murder rate of 6.9 of every hundred thousand, while New Orleans has a rate of 58), huge amounts of money are spent on a UN force which many Haitians do not want. The annual budget of the United Nations “peacekeeping” mission, MINUSTAH, for 2012-13, or $644 million, would pay for the construction of more than 58,000 homes at $11,000 per home. There are many stories of projects hatched by big names in the international community into which millions of donated dollars were poured only to be abandoned because the result was of no use to the Haitian people. For example, internationals created a model housing community in Zoranje. A $2 million project built 60 houses that now sit abandoned, according to Haiti Grassroots Watch. The majority of the hundreds of thousands of people still displaced by the earthquake have no other housing options. Those who were renters cannot find places to stay because there is a dramatic shortage of rental housing. Many of those who owned homes before the earthquake have been forced to move back into their despite the fact that these homes are unsafe. A survey by USAID found that housing options are so few that people have moved back into more than 50,000 “red” buildings that engineers said should be demolished. Most of the people living under tents are on private property and are subjected to official and private violence in forced evictions, according to Oxfam. More than 60,000 have been forcibly evicted from over 150 tent camps with little legal protection. Oxfam reports many in camps fear leaving their camps to seek work or food worried that their tents and belongings will be destroyed in their absence.